We are delighted to make publicly available the new ProTerra Standard version 4.0 that will come into force in June 2019. The ProTerra Foundation wants to thank all of those that have contributed with their suggestions and recommendations to the improvement of ProTerra Standard as well as the to the way it will be implemented in practice. Would you like to see the ProTerra Standard content at a glance? Please click here to download the full version in English. 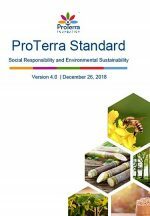 Furthermore, the ProTerra Standard version 4.0 has been benchmarked against the Sustainable Development Goals (SDGs), to facilitate the work of companies in identifying their contribution to the SDGs.